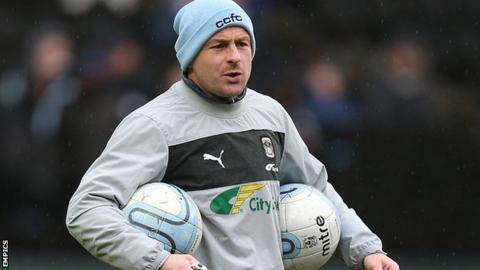 Caretaker manager Lee Carsley believes Coventry can use their Wembley near-miss to drive them to the play-offs. The Sky Blues lost 3-2 on aggregate despite in their Johnstone's Paints Trophy Northern Area final second leg on Wednesday night. "Why can't we win every game between now and the end of the season?" Carsley told BBC Coventry & Warwickshire. "The players are good enough and they want it enough. The proof will be in the pudding." Crewe went into the game with a 3-0 first-leg lead, but Coventry scored twice in injury time in Wednesday's second leg to set up a tense finish. Carsley continued: "It was always going to be an uphill task, but it was a task we were up for. "We had a game plan and we came here and executed it well. "Ideally we wanted to 'win' the first half. If we'd gone in two ahead at half-time, it really would have been game on." Having overseen two clean-sheet wins in the two games since being asked to stand in when previous manager Mark Robins joined Huddersfield, Carsley believes the Sky Blues have shown reaching the League One play-offs remains an eminently achievable target. Coventry are currently eighth in League One, six points off the play-offs. "We've shown we never give up," added Carsley. "That's two games, two wins, two clean sheets now, so if we can keep that up we really have got everything to play for."